MOSCOW, Russia - Ukraine finally gets a win against Russia. State-owned gas company, Naftogaz, was awarded $2.5 billion in a lengthy, ugly legal battle with Russian gas behemoth Gazprom. 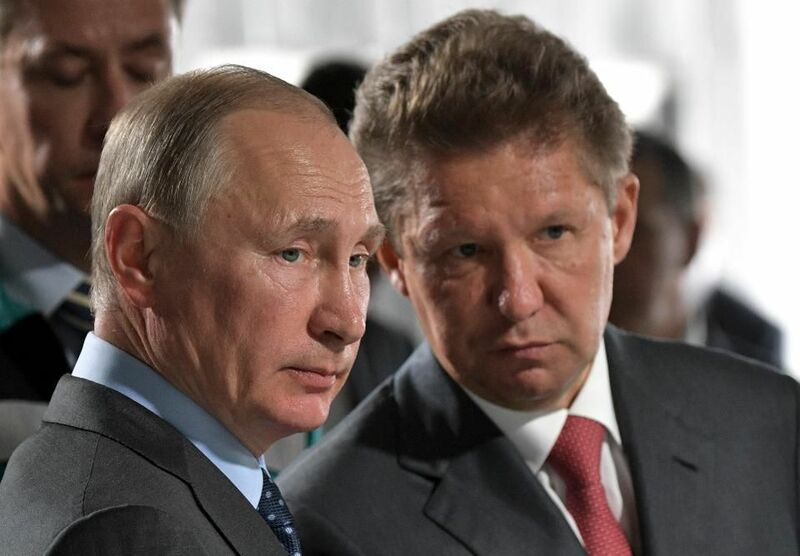 Vladimir Putin with Gazprom CEO Alexei Miller. Gazprom lost a sizeable lawsuit against Naftogaz on Feb. 28,2018. The Stockholm Arbitral Tribunal finally ruled on a years old dispute regarding natural gas transit fees in favor of the Ukrainians on Wednesday. Gazprom said they will appeal the ruling. Russia's revenge began immediately on Thursday when Naftogaz learned of Gazprom's decision not to supply gas to Ukraine this month. Naftogaz said it had already paid for deliveries. Russia and Ukraine's bitter divorce has Gazprom at the heart of the fighting. When former Ukrainian president Viktor Yanukovych rejected a European trade deal in favor of cheaper Gazprom gas, Kiev erupted in protest. Many Ukrainians felt that Yanukovych was choosing Russian interests over sovereign, economic interests. Yanukovych was kicked out of power in 2014, setting off a firestorm of reactions by the Russians that ultimately led to the annexation of Crimea, a southeastern peninsula in the Black Sea and home to Russia's only warm water Naval port; and a separatist war pitting ethnic Russians and pro-Kremlin militants against the Ukrainian government in the Donbass region along the Russian border. The move led to sectoral sanctions on Russian energy and finance and has ostracized Russia from the West. As the story goes, the Russians are the Cold War bad guys once again. It all started in Ukraine with these two energy companies going at each other's throats. The Russians seemed to always have the upper hand. Gazprom is one of the world's leading natural gas producers. It has a market cap of roughly $58 billion. For the Euromaidan movement activist of Ukraine, a Naftogaz legal victory would normally be boring news. But today it is more like the nuggets flowing out of the Robert Mueller Russia investigation: if it makes their enemy look bad, it's a score. There are many scores to settle still. Gazprom has the muscle to pressure Naftogaz by any means necessary, insiders said. Yesterday's tribunal in Stockholm found that Gazprom defaulted on its shipment obligations and awarded damages of $4.63 billion. The award means Gazprom has to make payments to Naftogaz in the order of $2.56 billion after residual payments for gas delivered in 2014 and 2015 have been settled. “We are pleased that we won the arbitration case on major accounts. This is an important day for the people of Ukraine and for the future of European gas markets”, Naftogaz CEO Andriy Kobolyev said in a statement. Kobolyev has become a vocal opponent of Gazprom's planned Nord Stream II pipeline, connecting Russia to Germany via the Baltic Sea. The pipeline would sit adjacent to the already existent Nord Stream I.
Kobolyev used the arbitration panel's ruling to take a swipe at the pipeline, which was sanctioned by Washington last summer but is not dead yet. He said today that Europe should "reconsider whether it is wise to let (Gazprom) strengthen its influence, which is already significant, on their market through the construction of Nord Stream." The Tribunal did not grant Naftogaz's claim for revision of the transit tariff because Naftogaz’s 2009 request for revision did not fulfill the procedural requirements. The Tribunal also did not accept Naftogaz's claims for revision of the Transit Contract based on European and Ukrainian energy and competition law, noting that the implementation of regulatory reform on Ukrainian territory is a task for the Ukrainian authorities and not the Stockholm court.